I'm poppin' over the moon for today's popover recipe. Poppin' for popovers. Say that ten times fast and I'll send you a whole basket of these delicious little guys. While you're practicing your popover speech, I'll just be sitting here, delving deep into the buttery pockets of a golden brown popover, which I have perfected thanks to many years of practice (and a few of my secrets that I've included in the notes of the recipe). Popovers are one of my absolute favorite foods. Give them to me for breakfast, or with tea, as a snack, with soup, or just give them to me straight. Anyway, anyhow, I will eat them, all of them. They're also perfect for Easter breakfast or dinner. And speaking of Easter, if you can keep yourself from eating this entire basket of popovers, later this week I'll show you how to turn these golden, fluffy clouds into a decadent dish worthy of any Spring brunch. Preheat the oven to 450 degrees, making sure to lower the rack one level below the middle. Grease the popover pan with butter, then place the pan in the oven while you mix the batter. In a medium-sized, microwavable bowl place the butter. Microwave for 30 seconds to begin melting it. Stir in the milk and continue microwaving for another 1-1.5 minutes, stirring the butter occasionally to help it melt. 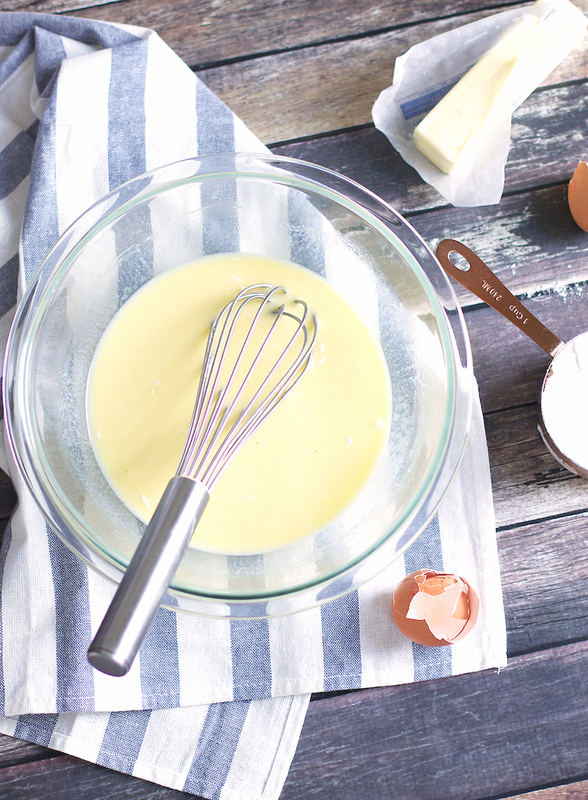 Quickly whisk in the eggs. Add the flour and salt and continue whisking just until everything is mixed together (all the dry ingredients should be moist). Yes, there will be lumps in your batter and yes, this is ok. Remove the pan from the oven. Fill each popover cup about 2/3 full with batter (I find it is easiest to use a 1/4-1/3 cup measuring cup to help with this process). Place the pan in the oven and bake for 15 minutes. Reduce the oven temperature to 350 degrees and bake for another 20-30 minutes, or until golden brown and crispy. Remove from the pan and serve immediately (be careful of hot steam when you cut them open). Store leftovers in an airtight container for up to 2 days. They can be reheated by placing them in a 350 degree oven for just a few minutes. Do note that the outside will get a bit crispier and darker when you reheat them. 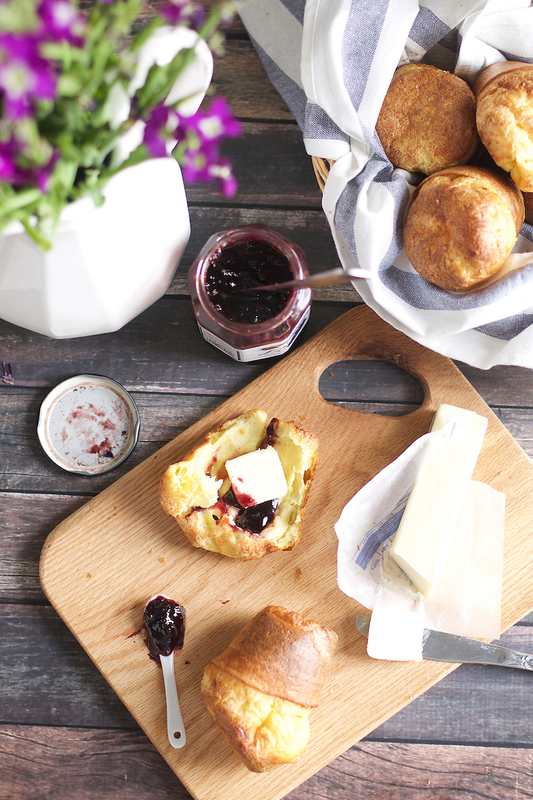 You can use a muffin pan or ramekins if you do not have a popover pan. Just be sure to adjust the amount of batter you use accordingly. 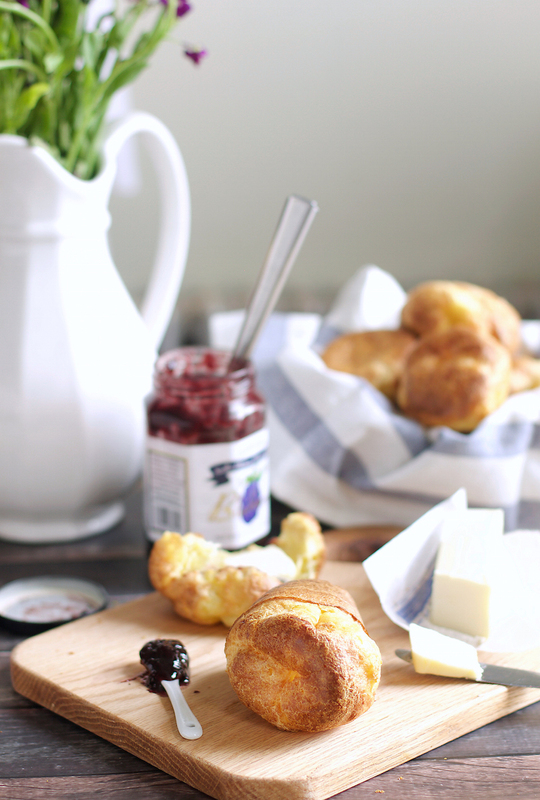 Popovers taste great as is, but I also love serving them with butter and jam. Using butter instead of cooking spray to grease the tin makes the outside of the popovers crispier. Preheating the pan helps the popovers to rise higher. Heating the milk helps the tops to get crispier and to keep them from deflating. Baking the popovers for a few extra minutes will keep the tops from deflating once the popovers are removed from the oven.